This was a slight let down only because it didn't match my first notion of what it would sound like. The beats were not what I was expecting, as some even sounded unfinished. That being said after a couple more listens it became clear how good this album is. In the end even a less than stellar effort from some artists will still be better than a solid effort from others. 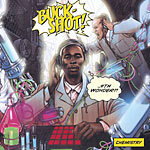 The combination of 9th and Buckshot is just too potent not to satisfy, even if it isn't what you expected. Standout tracks include Slippin, Food For Thought, No Comparison, U Wonderin f/Rapper Big Pooh & Sean Price, Out of Town (feat. L.E.G.A.C.Y. & Joe Scudda), I Don't Know Why (feat. Keisha Shontelle), and the bonus track, which isn't listed on the site. Plus the cd comes with a feature that lets you remix select tracks from the album. Good stuff.